Are you an entrepreneur, web designer, online marketer, or just interested in digital marketing? 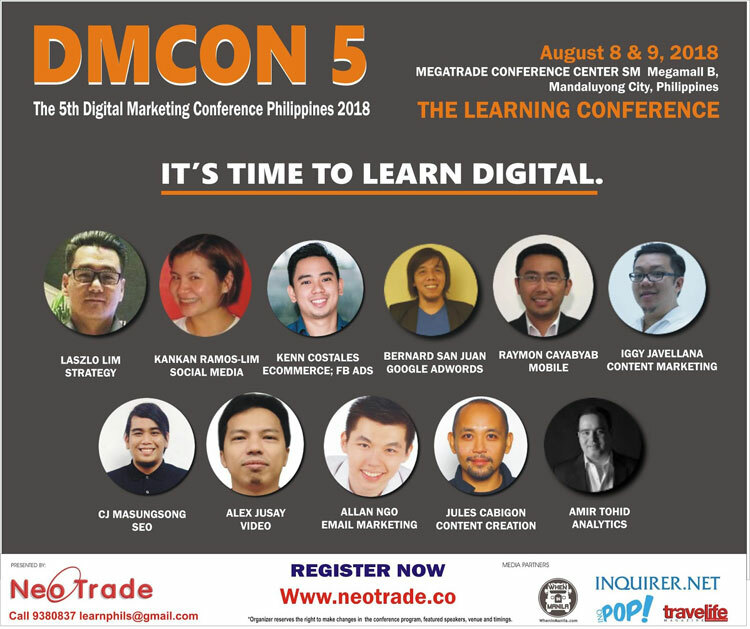 The 5th Digital Marketing Conference Philippines 2018 (DMCON 5) is just what you need to learn the latest digital marketing techniques or update your old skills in the field. The two-day conference brings you updated industry insights, knowledge and skills necessary for marketers to plan and implement their own digital marketing strategy. The conference brings together some of the biggest names in the industry to share their knowledge on digital marketing essentials to help boost your company’s online marketing campaign. Complete beginners and those who have a basic knowledge of digital marketing are invited to attend DMCON 5 which will be held on August 8 and 9, 2018 at the Megatrade Conference Center, SM Megamall, Mandaluyong City, Philippines. The “Digital Learning Conference” features 14 learning sessions on topics such as: Digital Marketing Strategy, Future Proofing Your Social Media Campaign, Facebook Marketing, Analytics, Video, Social Media Community Management, SEO, Mobile Marketing, Content Marketing, Email Marketing, E-commerce, Websites, Content Creation, and Google Adwords. Expected to attend are marketing officers, brand officers, communication specialists, academe, professionals, BPO sourcing and marketing and sales personnel, entrepreneurs/SMEs, government personnel, ad agencies, business leaders, freelancers, and students. Bring your company’s marketing team with affordable pricing and attractive group rates. To register for the conference, fill out the registration form or contact Neotrade at 9380837 or 09167312040. You can also email them at [email protected]. Check out the Digital Marketing Conference Philippines Facebook page or buy a ticket at Eventbrite.